PERSEPHONE’S ARMS WERE LOADED WITH her overnight stuff as she walked into the school gym Friday night. Looking around, she saw that the gym floor was covered with a big jumble of sleeping bags, snacks, makeup, board games, and a few stuffed animals. A huge glittery sign on the far wall read: MOUNT OLYMPUS ACADEMY GIRLS’ ATHLETICS SLEEPOVER TONIGHT! Most of the girls were already here by now. It had taken Persephone longer to arrive because she was one of the few MOA students who didn’t live in the Academy dorm. Instead she lived with her mom, Demeter, on Earth. And she’d forgotten to bring her overnight things from home this morning. So she’d had to go all the way back to get them after school was out. She set her belongings on the gym floor and then unrolled her sleeping bag. It was decorated with a pattern of cute stylized daisies on one side. The other side was a solid pale green that matched the color of her eyes. She scooched her bag next to a pink glittery one that had to be Aphrodite’s. A bright blue bag decorated with math equations lay on the other side of Aphrodite’s. Persephone figured it belonged to their brainy friend, Athena. And the red one with the quiver of arrows lying beside it? Artemis’s for sure. Another bag covered with question marks was Pandora’s, no doubt. She was the most curious girl in the Academy, and was also Athena’s roommate. “Hey, Persephone!” yelled a girl’s voice. Persephone pushed her long, red curls out of her face and looked across the gym to see Aphrodite, Athena, and Artemis waving her over. She grinned and waved back. Hopping up, she headed toward her three best friends. They and some other girls were over in the middle of the gym creating silly cheers. Most of those here tonight—like Pandora, Pheme, and Medusa—were on the MOA flag team. But members of the Goddessgirl Squad Cheer team were here tonight too, including Persephone, Athena, Aphrodite, and Artemis. For a few seconds Persephone stood off to the side watching the unfamiliar routine the others were doing. Quickly catching on, she joined in the fun, copying the moves and saying the words along with everyone else. What do Earth mortals think of us? When they finished, some of them did air-splits. Others shook their blue and gold pom-poms or tossed them high. Persephone whooped and clapped. It was fun being on the GG Squad with her three best friends. Except for Cheer, she wasn’t really into sports. Still, she had managed to win the long jump in the first-ever Girls’ Olympic Games not long ago. She’d had a good coach. The best. An MOA godboy named Hades. “I’ve never heard that cheer before,” Persephone commented after she caught her breath. “Isn’t it cool? Pheme just made it up,” Pandora told her. She and a bunch of the other girls who’d been doing the cheer were hanging around and chatting nearby. The words she spoke puffed in cloud-letters that swiftly rose above her head, and then slowly faded away. Not long ago she’d been caught red-handed snooping around in other girls’ rooms. But that hadn’t prevented her from landing a new job at the scrollazine. And really, the job of gossip columnist was perfect for the nosiest girl at MOA! “Thanks.” Looking pleased at the praise, Pheme fluffed her short orange hair with her fingers, making it even spikier. “Want to see the poll?” Pandora asked Persephone. Without waiting for an answer, she dashed over to the sleeping bags on the floor and grabbed a copy of the scrollazine. Meanwhile, Aphrodite had wandered over to Medusa. From the snippets Persephone overheard, it sounded like Aphrodite was trying to talk the snake-haired girl into letting her do a makeover on her. Persephone smiled to herself. Good luck with that, Aphrodite! she thought. Medusa was not only snake-headed, with actual live reptiles growing from her head—she could also be hardheaded and superstubborn. And since she wasn’t a girly-girl, a makeover didn’t seem like anything she’d be interested in. Couldn’t blame Aphrodite for trying, though. She was the goddessgirl of love and beauty, after all! A hand nudged Persephone’s arm. Pandora had returned with the issue of Teen Scrollazine she’d gone to fetch. When Persephone didn’t take it right away, Pheme grabbed it instead and started unrolling it for her. In her enthusiasm, she held the scrollazine superclose to Persephone’s face. Persephone drew back a few inches, trying to focus on the words before her eyes. “Here it is. See?” Pandora helpfully pointed out the poll in Pheme’s article. The top two answers had been the power to fly and the power to become invisible. Medusa had been disappointed that no one had chosen the power to grow snakes from their head. Of course that wasn’t really an immortal power. Medusa was the only one who actually had snake hair, and she was mortal. Quickly Persephone scanned the list of categories and corresponding mortal and immortal MOA students named in this week’s scrollazine. They included: Most Academic: Athena; Most Glamorous: Aphrodite; Best Athlete: Artemis; Most School Spirit: Pandora. There were boy names mixed in too. Best Musician: Apollo; Most Dramatic: Dionysus; Strongest: Heracles; Handsomest: Ares; Most Fascinating: Hades. Persephone’s eyes lingered on that last one. She found Hades fascinating too! “I just love polls, don’t you?” she heard Pandora ask another girl. Persephone looked up to see that she’d been speaking to Atë, a spirit-goddess who also attended MOA. Athena, Aphrodite, Artemis, and some other girls had gathered nearby too. “I see some familiar names on this list,” Persephone told her three best friends in a teasing voice. She and Ares had an on-again, off-again friendship. For now it was on again, and they seemed to be getting along great. But you never knew from one week to the next how the wind blew with those two. Unlike them, Persephone and Hades had become good friends almost the minute they’d met. And they’d stayed that way. She stared at the poll, thinking that he would have a very different reaction to finding out he was in it than Aphrodite thought Ares would. The girls around her laughed. She didn’t say so right then, but she also thought there were depths to Hades’ character that others sometimes missed. So in her opinion it was nice that mortals considered him fascinating. She agreed with them! She was always learning something new about him. Really, there was no other boy she’d rather hang around with. Persephone carelessly skimmed the rest of the poll. Other categories included: Best Eyes, Class Clown, Best Hair (Aphrodite again), Most Artistic, Best Smile, and Best Personality. She started to give the ’zine back to Pandora, but then suddenly drew it back. Because she’d spotted her own name! Huh? Pink bloomed in her normally pale cheeks. She scrunched her nose as she looked up at her friends. “Dependable?” she asked. “What’s wrong with that? It’s a good thing,” Aphrodite told her. “And being chosen shows that mortals love you as much as we do,” Athena added. “How could they not?” She gave Persephone a quick hug, seeming to sense her displeasure over the label she’d been given. But Persephone was having none of her friends’ cheery encouragement. Dependable? She was not at all flattered by how mortal voters saw her. Not one bit! Her friends exchanged worried glances and shot her looks of concern. “Everybody notices you,” Aphrodite assured her. “Yeah, and even if mortals do think you’re like sandals, I’m sure they at least think you’re the cool silver-winged kind,” Artemis piped up. Persephone couldn’t help grinning a little at Artemis’s idea of support. Still, she wasn’t sure which was worse—being voted Most Dependable or having her friends try so hard to convince her it was a good thing. It was like they agreed she was boringly dependable and were trying to make her feel better about accepting the truth. Good thing the mortals voting in this poll can’t hear me now, she thought. They would vote me Biggest Bad Sport Ever! “Sorry,” she said softly. “I know I’m being grumpy, but . . .” Her words trailed off. The label she’d been given in this poll was really getting to her. Did everyone at MOA also find her dull, boring, and dependable? “It’s a compliment to be mentioned in my poll,” Pheme puffed in a lofty voice. “I know,” Persephone said, hoping she hadn’t hurt Pheme’s feelings. But she couldn’t help wondering if everyone at the Academy would soon be thinking: Why would the Most Fascinating godboy hang out with the Most Dependable goddessgirl? Those two traits did not go together at all. And what would Hades think? Normally he didn’t read Teen Scrollazine. Still, he was bound to hear about the poll. His friends would tell him. “I don’t want to hurt your feelings, Pheme, but this poll is totally wrong,” someone said. Persephone glanced over her shoulder and saw that it was Medusa who’d spoken. At last, someone who did not think her dependable! Although Persephone believed her to be wrong in this instance, she admired the way Medusa stuck up for herself. Must be nice to be so confident that you always thought the best of yourself no matter what other people’s opinions were. At least, that’s how Medusa came across to her. “Hello? The poll is about having school spirit, not about being a spirit,” argued Pandora. “And don’t you think someone who dyes her hair to match MOA’s school colors should get voted in for that? Or did you think these blue streaks in my hair were natural?” She bent her head to give everyone a better view of her blue-streaked golden hair. Athena wrinkled her brow. “Why do we have to label people anyway?” she asked. “Exactly,” said Persephone. She let go of the bottom end of the Teen Scrollazine she was holding. It instantly rolled itself shut. Snap! Really, there were two sides to her personality, Persephone thought as she handed the ’zine back to Pandora. A light side and a dark side. Sometimes she was happy and upbeat. The rest of the time, she liked being left alone with her own thoughts. It was ridiculous that others had put one label on her! Yet they had. Right there in that poll. She wondered what she could do to change mortals’ perception of her. Suddenly she noticed that a silence had fallen around her. Had her grumpy behavior put a damper on things? Hey, she was here to have fun tonight, not to have everything ruined by a goofy popularity poll. Pandora had unrolled the scrollazine again and was rereading the poll on its back cover. Persephone’s eyes fell on the front cover, which was facing her way. Its main headline read: THE ORPHEUS ROCKS THE GODS CONCERT TOUR TO KICK OFF THIS SATURDAY NIGHT ! Below that was a picture of a mortal boy rocking out on a stage, with fans crowded around his feet. He had turquoise eyes and thick, spiky brown hair. “Ooh! 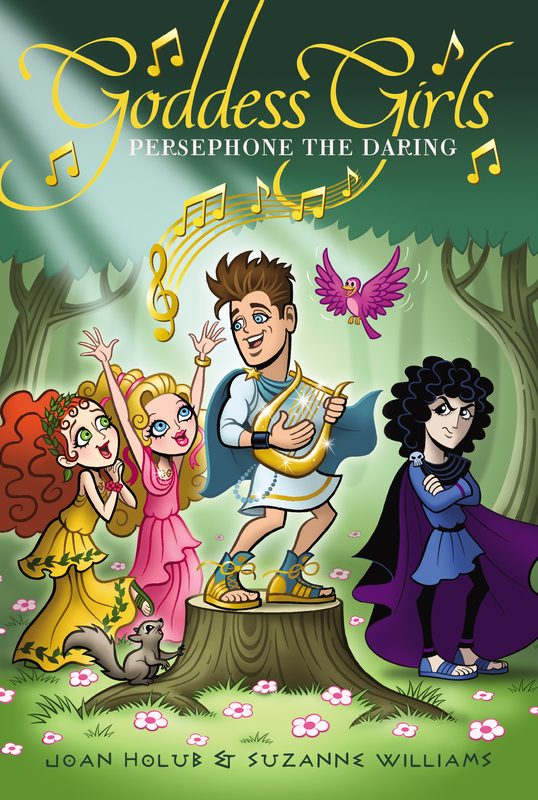 Is that Orpheus?” Persephone took the scrollazine back to study the picture on the front page, then turned it toward the group so they could see. “Talk about fascinating! And amazing singing-wise,” she added in an awed tone of voice. She was a huge fan of Orpheus’s music, so she truly meant what she said. He was the most popular rock star she knew. Like many MOA students, she even had a poster of him on her bedroom wall. She’d hoped that changing the subject would lighten everyone’s mood. Her ploy worked! “He’s sooo cute,” Atë agreed, clasping her hands in adoration. “Mega-dreamy-cute!” corrected Aphrodite, pretending to swoon over how cute Orpheus was. Then she laughed. The ’zine poll should’ve named Aphrodite as having Best Laugh too, thought Persephone. That girl pretty much had it all when it came to attractiveness. Luckily, even though Aphrodite was well aware that she was the most glamorous girl at MOA, she wasn’t at all stuck-up about it. “Apollo loves Orpheus’s new song,” said Artemis, peering at the picture of the pop star. Her twin brother, Apollo (voted Best Musician), led a band called Heavens Above that played for all the Academy dances. “You mean that song ‘You A-Muse Me’? My snakes love it too,” said Medusa. Everyone stared at her. “What?” she demanded, sounding uncomfortable. “How do you know they like it?” asked Pandora. There was silence for a few seconds as everyone seemed to be trying to picture that. As most of them knew, Medusa treated her snakes as pets. “So who’s going to the concert tomorrow night?” Persephone asked, changing the subject again. Immediately the hand of every girl in the gym shot into the air. Ye gods! Why had she said that? Truth or Dare was far from her favorite game. In her opinion some things were too private for truth. And dares could lead to trouble. But since she was determined to keep steering the conversation away from the poll, the words had popped out of her mouth before she’d been able to come up with something better. “I’ll play!” said Atë excitedly. Ten other girls volunteered too, including Aphrodite and Athena. “What’ll we use for a spinner?” asked Pandora. “One of my arrows?” suggested Artemis. She trotted over to her sleeping bag and got her quiver. When she returned, she drew out a silver arrow and handed it to the closest girl, which happened to be Persephone. Then, seeming to notice that some of her remaining arrows were dull, Artemis plopped onto the floor and began sharpening their tips. Persephone dropped cross-legged onto the floor beside her. The other girls sat too, forming a big circle of a dozen girls, with the arrow in the center. “Whoever the arrow tip points to after it comes to a stop will be asked ‘Truth or Dare,’ ” Persephone said. With a flick of her wrist, she spun the arrow. When it stopped spinning, its tip was pointing at Athena. “Oh!” said Athena, looking a bit flustered. “Truth or Dare?” Persephone asked her. As everyone laughed, Athena leaned forward and spun the arrow. This time it landed on Medusa. “Truth,” Medusa said before Athena could ask her to choose. “Is it true you gave all of your snakes names?” Athena asked her. Medusa nodded. When everyone stared at the top of her head curiously, she crossed her arms, getting defensive. “Draw a picture, why don’t you?” she said. Although the snakes were preening under the girls’ attention, it seemed to make her uncomfortable. After her a few more girls spun the arrow. Some chose truth and others dare, but all were easy challenges. Then it was Atë’s turn. She spun. The arrow was a blur as it whizzed around. When it stopped, its tip was pointing straight at Persephone. “Truth or Dare,” Atë asked her. Persephone froze. She could see the expectation in everyone’s eyes. They thought that good old dependable Persephone would choose the “safe” option. They expected her to choose truth. But was that really the safest option? Not necessarily. It depended on the question. Too late Persephone recalled that Atë was the spirit of reckless impulse. Spirit-goddesses like her had fewer magical powers than some immortals at MOA, but way more than mortals, who had none at all. Anyway, she was exactly the wrong person to ask for a dare.